What is AFG Rent A Car? AFG Rent A Car is a multi-language, multi-currency vehicle rental software. The technology provides two database managers – Access and SQL server – to deliver optimum performance of different tasks related to renting out vehicles, such as full accounting functionalities, monitoring of vehicle status, sending maintenance reminders, generating in-depth analytics, and customizing reports or forms. AFG Rent A Car boasts of reliable security features and maximized speed to help rental businesses operate more effectively and productively. Users are not provided with direct access to other database files, thus ensuring that they cannot copy or delete anything. However, retrieval by authorized personnel is convenient due to the system’s powerful searching capabilities. AFG Rent A Car allows computers from different remote locations to work online together. Users can also control all aspects of their business and process daily, weekly, and monthly rental contracts. AFG Rent A Car can be used by a variety of customers as it supports virtually all currencies and languages. In spite of having advanced features, the software is presented in a user-friendly interface and can be learned easily even by those with minimal technical expertise. Whether you are renting out just one car or operate a number of rental vehicles, AFG can control all units individually. There is no need to purchase multiple licenses for each car rented out, thus saving business resources. AFG Rent A Car offers full accounting functionalities. Service providers can build their Balance Sheet and Profit and Loss Reports faster and more easily, so that they may focus more on actually serving their clients. The software can conveniently receive Salik fines from the internet. This elmininates the need to enter every item manually. The AFG Rent A Car system warns users of upcoming expiry dates of car registrations and insurance. It also sends reminders for maintenance services, such as change oil services and repairs. Aside from vehicle-specific details, the program also reminds users of driving license expiry dates. With AFG Rent A Car, users can compute fuel charges, calculate extra kilometers, and keep track of late return charges in contracts. This helps businesses stay on top of their finances. The software has features to customize business materials. Users can place their logo and branding details in templates for contracts, receipts, vouchers, and other reports. 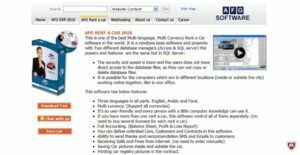 If you are interested in AFG Rent A Car it could also be beneficial to investigate other subcategories of Best Car Rental Software collected in our database of B2B software reviews. Companies have different wants and requirements and no software application can be ideal in such a condition. It is pointless to try to find an ideal off-the-shelf software system that meets all your business wants. The smart thing to do would be to modify the system for your specific requirements, worker skill levels, budget, and other elements. For these reasons, do not hurry and invest in well-publicized popular systems. Though these may be widely used, they may not be the best fit for your particular requirements. Do your homework, check out each short-listed system in detail, read a few AFG Rent A Car reviews, contact the vendor for explanations, and finally settle for the app that presents what you require. How Much Does AFG Rent A Car Cost? We realize that when you make a decision to buy Car Rental Software it’s important not only to see how experts evaluate it in their reviews, but also to find out if the real people and companies that buy it are actually satisfied with the product. That’s why we’ve created our behavior-based Customer Satisfaction Algorithm™ that gathers customer reviews, comments and AFG Rent A Car reviews across a wide range of social media sites. The data is then presented in an easy to digest form showing how many people had positive and negative experience with AFG Rent A Car. With that information at hand you should be equipped to make an informed buying decision that you won’t regret. What are AFG Rent A Car pricing details? What integrations are available for AFG Rent A Car? If you need more information about AFG Rent A Car or you simply have a question let us know what you need and we’ll forward your request directly to the vendor.